Process Record | Mitchell Scientific, Inc.
A process record is created when an Emission Master model is imported into Emissions Accountant and a process name is assigned. 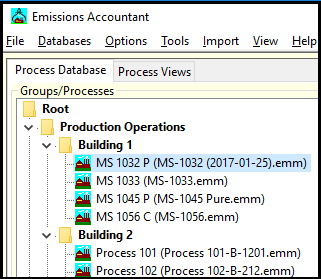 The emission calculations associated with the Emission Master process model will represent the emissions that occur when one or more batches of the process is completed in the factory. Once the process record has been completed then production records can be assigned to meet emissions tracking and reporting needs. If a process is revised in the factory then a new Emission Master model can be created and imported into the process record to be effective on the process change date. Any production that takes place before the process change will use the original process emissions and any production that takes place on or after the process change will use the process change emissions.